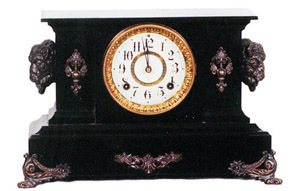 Ansonia Clock Co. enameled iron case black mantel clock, "Brandon", ca 1904. The end pieces are castings of rams heads, bronze ornaments, gilt bezel and sash. Signed paper dial. 8 day, strikes a gong half hour and hours. Iron case is 10 inches high, 16 inches wide and extremely clean, the case was probably restored at some time.- it is too nice. Correct pendulum and back door.